The revolution, it turns out, was televised after all: Antiwar marches in Washington, D.C.; riots over racial equality in Watts, Detroit, Birmingham and elsewhere; protests at the national political conventions. Yet those upheavals of the 1960s and 1970s were largely glimpsed at only in snippets on the network evening news—blind men trying to describe an elephant by feel. But another revolution was taking place, a revolution to cover the revolution, starting with the 1967 introduction of Sony's model DV-2400 Video Rover—the first portable videocassette recorder and camera combination, commonly called portapaks, that the general public could buy. Suddenly, ordinary people could have the newsgathering and documentary power, if not necessarily the reach, of network professionals. In a 21st century where we all carry TV cameras in our phones, it's hard to imagine the sheer force of this media development. Before even the nascent world of studio-bound community-TV channels on early local cable systems, there was now a community taking portapaks into places few video cameras had gone before. Chief among those people were the video revolutionaries of the whimsically named Top Value Television, a.k.a. TVTV. As producer and director Paul Goldsmith, a veteran of that loose collective, guides us in this fascinating documentary, we get a ground's-eye view of images as historically startling and significant as those of the earliest photographs and films. How so? Because TVTV's small, unobtrusive cameras could report on the same events as mainstream media but in unexpected ways the mainstream did not. The merry band of longhaired twenty-somethings could take their lightweight portable equipment onto the floor of the 1972 Republican National Convention, for instance, and into crowds where big, heavy, wired cameras could not. And turning the spotlight on the media itself, they would talk to network reporters to comment, albeit clumsily, on how network news was covering the event. Sometimes it didn't work, and befuddled establishment broadcasters would sit bewildered and stonewalling, unable or unwilling to grasp that the times they were a'changing. 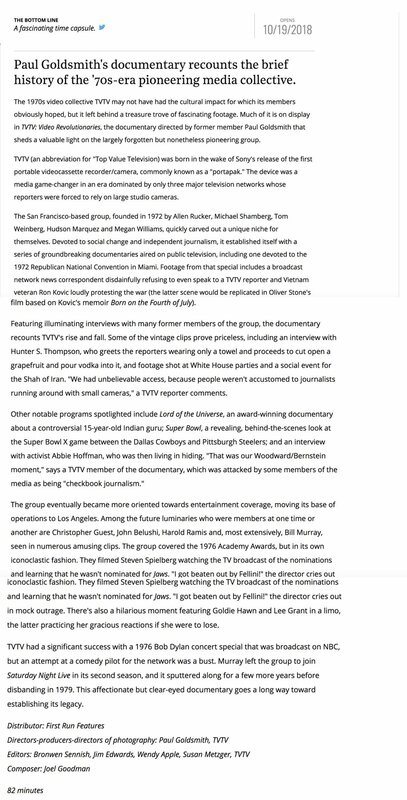 In one wonderful sequence, Williams describes how a Washington newspaper's social correspondent took TVTV under her wing and invited them to "five parties a week," giving the collective access to politically influential events to which mainstream journalists weren't invited. Socialites found them and their little cameras cute, and political insiders, such as at a party for the Shah of Iran, grasped how these upstarts shooting video could be used to position themselves favorably. 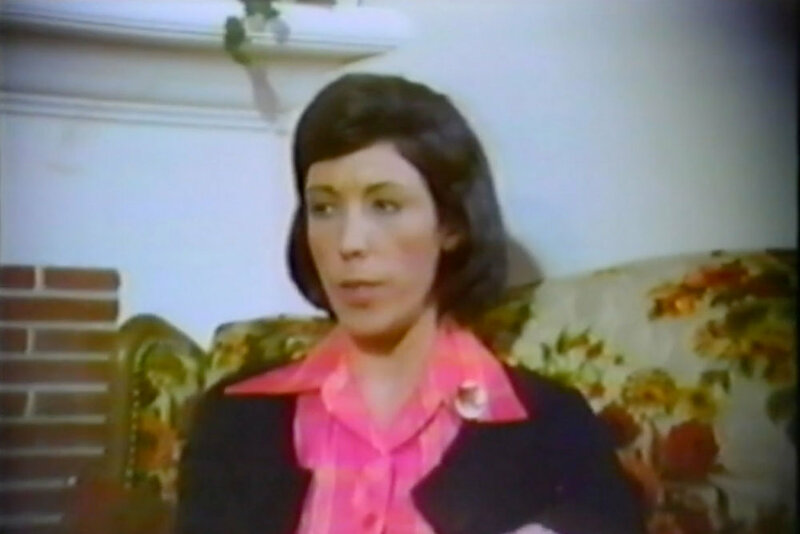 At one White House party, President Gerald Ford's social secretary told the TVTV people to just put their press passes away and enjoy themselves as they shot what they wanted—showing us a post-Nixon time when the White House did not consider the press the enemy of the people. 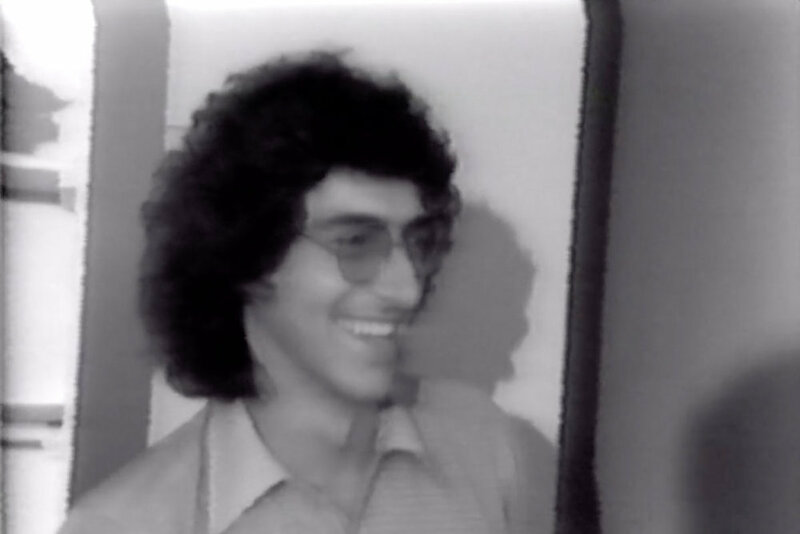 TVTV lasted from 1972, a year after TVTV co-founder Michael Shamberg had published his DIY manual Guerrilla Television, until schisms in the group reached critical mass in 1976. In between, fellow founding members such as Hudson Marquez, Allen Rucker, Tom Weinberg, Megan Williams and the late Wendy Apple, who along with Shamberg are all interviewed here, pointed their cameras in a different direction than the mainstream, creating segments for New York City's public-TV station WNET and eventually for cable and, ironically, for CBS and other mainstreamers. They produced TV documentaries, including the DuPont Award-winning "Lord of the Universe" (1974), about a controversial spiritual guru. They reflected the counterculture, but even more so reflected the sensibilities of baby-boomer youth who were the first generation to grow up with television and who had absorbed the medium intrinsically and organically, the way children today seemingly are born knowing how to type and use the Internet. This documentary is wisely less weighty than it is a fun, informative look back on a time of a halcyon future. We see fledging performers/producers such as Christopher Guest, Bill Murray and Harold Ramis, who were part of the collective, as well as future Vanity Fair correspondent Maureen Orth. There is vintage, little-seen footage of Abbie Hoffman, Hunter Thompson, Henry Kissinger, Ron Kovic, Ken Kesey, Lily Tomlin, Goldie Hawn, Lee Grant and others, including Steven Spielberg and friends watching TV the day the 1975 Oscar nominations were announced, and learning he didn't get a Best Director nod. ("I got beaten out by Fellini!" he says in mock outrage). The last board meeting of TVTV was held on Jan. 11, 1979. "We came into this fully convinced we would revolutionize TV," Williams reflects, adding sadly, "TV itself didn't budge." Maybe, maybe not. But the technology that TVTV and other such collectives embraced did eventually describe the elephant, with the portapak promise eventually becoming part of our visual landscape and language. 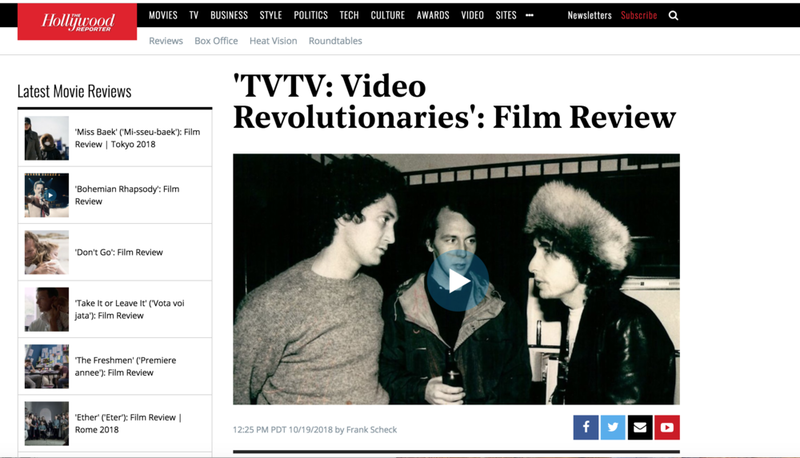 TVTV: Video Revolutionaries is a lively reminder of where that came from, and a portrait of people who held hope in a time that felt as hopeless as now. Whether ousted by the gatekeepers of journalistic intellectualism, intrigued by the idea of producing pure entertainment, or both, TVTV moved to Los Angeles in ’76, and — in part facilitated by Rucker and Shamberg’s college pal, Harold Ramis — set their sights on turning their pioneering lenses in a different direction. 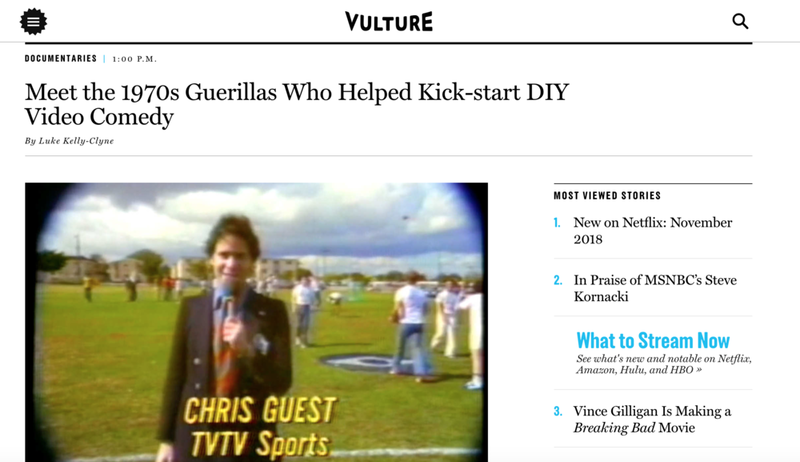 In addition to directing some of the most definitively funny work for TVTV, including a WNET-sponsored special called Supervision featuring a young John Belushi, Ramis introduced the newly relocated TVTV crew to DIY comedy as we know it. Thanks in large part to his connections, TVTV ended up in the midst of comedy-royalty years before they or anyone else knew it. Also in ’76, TVTV covered the ’76 Super Bowl (after Bill Murray’s aforementioned pregame sideline shtick) where correspondents ignored coaches and QBs in favor of sneaking a locker-room look at Cowboys tight end Jean Fugett’s team playbook. (Seriously, they filmed the plays and put them on national television.) Then they gave Steelers legend Lynn Swann his own Portapak to do as he damn well pleased in man’s earliest version of a social-media takeover. Hell, TVTV even interviewed players’ wives poolside decades before VH1’s Basketball Wives was a glint in Viacom executives’ eyes.